Kala`au sticks are used in hula performances; they are struck together to make a clicking sound. 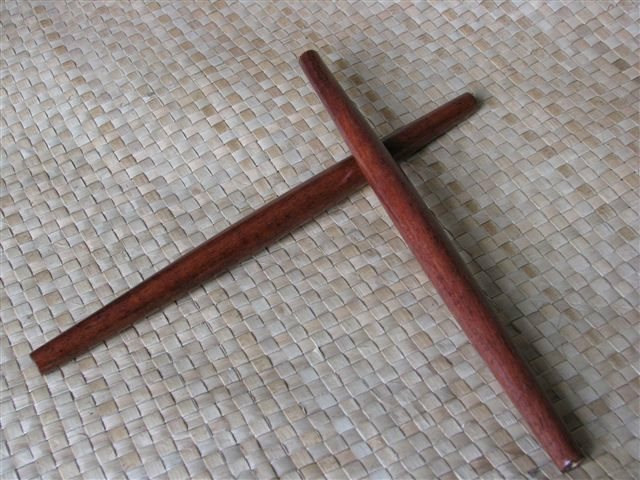 Kala`au are usually used in pairs, some pairs are short sticks in accompaniment with long ones. The long stick is struck by the short one or hit on the floor for a deeper tone. The short stick pair are sometimes used by the chanters as a means to keep the rhythm of the song. "Ka" means "to strike" and "la`au" means "wood." "Kala`au" mostly refers to "stick dancing." Our kala`au are 12 inches (30 cm) long and sold in pairs. Great sound, easy to handle. Nice size, fast shipping. Sturdy and product. Great quality. I have ordered this item twice in the past and very pleased with the quality and appearance. Good sound and nice finish.